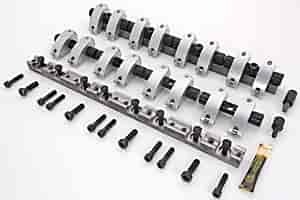 JESEL Sportsman Series rocker systems have proven themselves to be the ultimate replacement for inadequate stud rocker assemblies on OEM and aftermarket cylinder heads. Easily able to handle today's aggressive springs and cam profiles, these 2024 aluminum bodied shaft rockers are designed to withstand open spring pressures up to 900 lbs while maintaining precise valve lash settings. Both racers and engine builders have been rewarded with years of reliable, trouble free service of their Sportsman Series rockers on countless applications from daily drivers to bracket drag cars, various marine applications, oval track dirt and asphalt racing. JESEL Sportsman Series rocker kits are designed to bolt on without any cylinder head modifications and in most cases still fit under a stock valve cover. The rocker geometry is preset and engineered using the common valve supplied with the particular cylinder head to provide a bolt-on and go installation.